Hey Casey I was wondering how long till your next episode will be released you inspired my oldest son and myself. This was my first official Podcast binge and review! A bunch of awesome interviews within this Podcast! Thanks for the content. Aloha from Hawaii!Keep up the great content. Love the podcasts and hooked with the quality of people Casey has interviewed! Love it. Mahalo!! Casey learned from a young age that the answers to life's oldest questions don't come from within, they come from asking others. Hey brother that latest interview with Ed Mylett was really on point. You really keep your calm and stay on track in your mind which makes the interviews always go great. Keep up the hard work and excited for where your path leads you!! The Rise of the young prod cast has key essential topics of absolute thrilling information. All around keep up the good work! I enjoy listening to this podcast very much. Itâs very in depth and i canât wait to listen to more of this podcast in the future! I have already learned so much and canât for more. Casey is a hustler, lot of value throw in these podcasts! 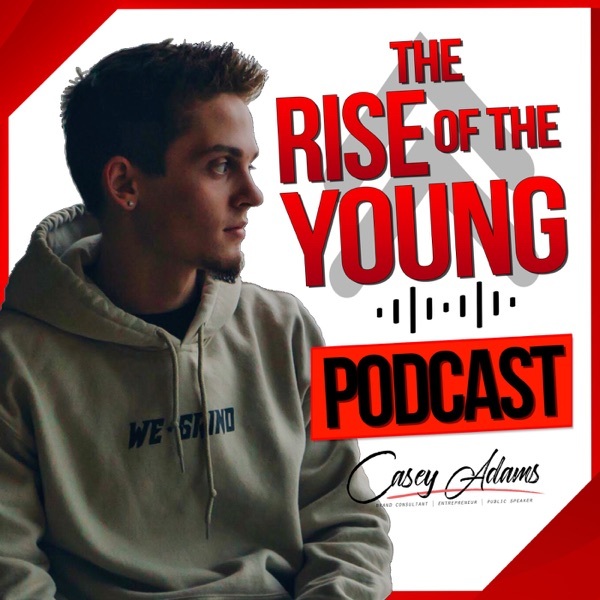 Casey Adams, host of The Rise of the Young Podcast, highlights all aspects of entrepreneurship and more in this canât miss podcast. The host and expert guests offer insightful information and advice that is helpful to anyone that listens! Amazing podcast listen to daily ! Thanks Casey keep up the great work ! Casey, you are an incredible individual. Following you for right at a year now. Super proud and inspired with everything you are doing. These podcasts bring so much value, I feel bad not paying for them ððð¥ð¥See you in Snoqualmie!! I listen to the rise of the young podcast everywhere I go no more playing itunes music! A lot of value with all the amazing interviews! Casey you the man keep killing it I hope to meet you soon one day! Casey Adams changing the game!!! Tremendous inspiration for todayâs millennial youth!!! Iâve met Casey a few times and this young man is the real deal!! He truly is making moves at such an early stage and NETWORKING with the best of the best. Canât wait to see what this year brings. If the past is any indication you will find him as one of the most notable Millenial weâve ever seen! This dude has been amazing to watch! This is amazing I have already learned so much like traveling and instagram. My favorite podcast yet. This kid is definitely on the rise! Great Podcast!! #1 podcast soon!! Shout out to CaseyAdams killing !!! Shout to Bryan Rivera for introducing me to this awesome podcast!! Love listening to this podcast. PACKED WITH PRACTICAL VALUE !! Amazing !!! You have to give this guy a millions props for finding a way to become viral in snap chat, the most intimate/private form of social media. Would love to see more podcasts from him! Zach has some bombass snaps and thatâs the only reason why I enjoy being on Snapchat. To watch the vids. This is awesome, really informative! I enjoyed listening and learned a lot! Casey is giving away some golden nuggets. If you have not already subscribed or are on the edge... JUST CLICK THAT BUTTON. Every episode is a must watch!! Thank you so much, canât wait for more! PS. He definitely earned those 5 stars. I watch these snaps everyday and constantly refreshing for more! Go zach! I've never listened to a podcast before but this was definitely worth the listen. It's nice to be able to hear an "inside" take on starting small and growing to be well known. This episode was very entertaining. Showed a lot of key tips. Good insight and very helpful for anyone looking to expand social media popularity! Loved hearing "Nochillsnaps" interview. Definitely going to listen to your other podcasts, very interesting content. Amazing interview with Zack Wenger. Honestly so inspiring and honestly he shows that anything is possible! I cannot believe you have a million views and keep doing what you are doing! If youâre a young entrepreneur on your journey to greatness, you gotta subscribe and listen to Caseyâs podcast! He spits straight facts and gives very tactical info you can apply ASAP. Donât play yourself, subscribe now. This podcast gave me a bunch of helpful advise and I love all the tips. I wish the call sounded clearer but I still love it! Great podcast very informative want to grow your social media check out episode 11!!! Best Snapchat account out there!!! Wonât regret it!! !